That’s a lot to go through in two weeks! Our directors are the husband and wife team of Sherrill Milnes, the famous Verdi baritone, and his wife Maria Zouves, an accomplished soprano in her own right. Together, they have been working assiduously with the entire cast, helping us really digest the words and get in touch with our respective characters. 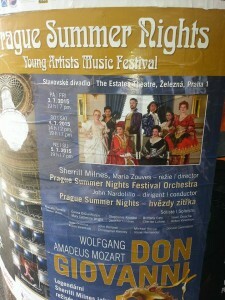 We’ve been very fortunate to have access to large, high-ceiling rehearsal spaces in the Czech National Opera’s facilities, and we’ve even seen posters advertising our upcoming performances around the city! Everyone expects turnout to be very high for all 4 performances. After the requisite music run-through with piano the first week, we immediately began working on understanding the libretto. We did various exercises alone and in groups, all designed to help us discover the meaning of Lorenzo Da Ponte’s archaic Italian vernacular and bring it forward into modern English. This really helped me understand Donna Anna’s motivations, and it made it easier to interact more naturally with the other characters in group scenes. It also helped me stay in character when I was onstage but not singing. Young singers have a habit of falling out of character as they are waiting to sing their next line, but this can be overcome if the you think about your character’s intentions at that point in the scene while you are waiting. And to really understand those intentions, you need to truly understand what you are saying, and what everybody else is saying! Maria and Sherrill have also been very strict with regards to Italian diction and pronunciation. Although everyone came prepared, Sherrill said we ALL need more consonants! In order to be understood at the very back of the theater, a singer needs to make sure consonants are crisp and explosive; otherwise words sound indistinct and muddled. We Americans also tend to pronounce our vowels too far back, making them darker and more covered than Italian vowels, which are much brighter and very forward. Another thing we all need to work on is not truncating vowels and jumping ahead to the next consonant. For example, in the word “questo,” a typical English speaker will say “ques-to,” assigning the “s” and the “t” to different syllables. However, a native Italian speaker will say “que-sto,” waiting to pronounce the consonant group “st” until the very last moment. There were many more such corrections throughout rehearsals, and we all worked hard to fix our own individual issues. 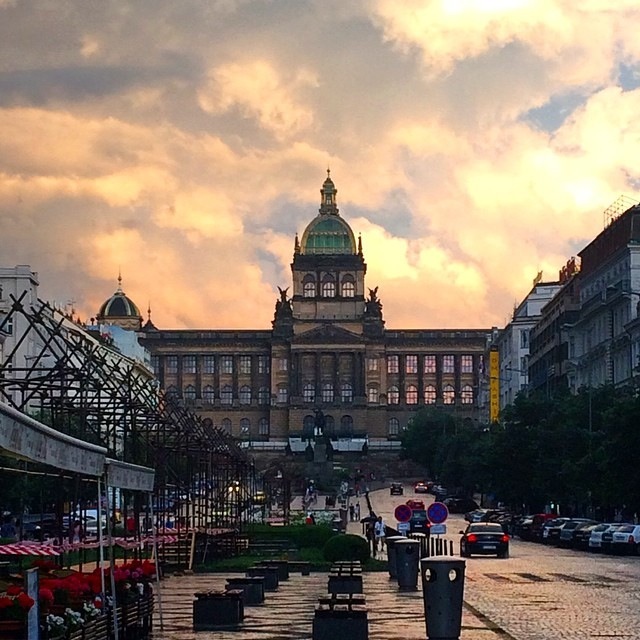 Prague…wow I love this city. Everything is amazingly beautiful, from the ornate buildings literally everywhere, to the cobblestone streets – also literally everywhere! There are street musicians at the most popular town squares, as well as farmer’s markets where you can get yummy fresh veggies and fruit, and there are gelato stands all over the places serving the most delicious gelato flavors ever. I wanna stay here forever! Well, I’m off to bed, it’s been a loooong day. Hopefully I’ll find the time to write another update before the end! I will leave you with a handful of photos I’ve taken so far. 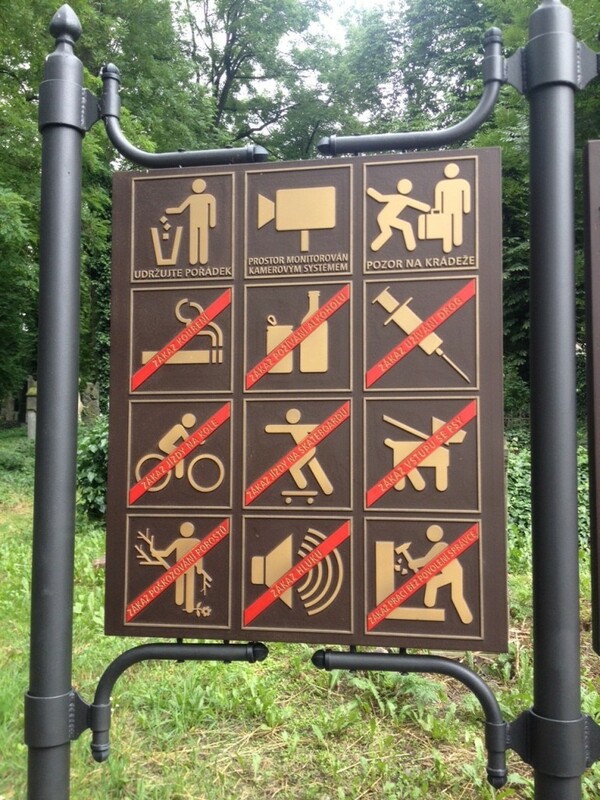 Visitors may throw trash away, use videocameras, and steal suitcases…all other behavior is forbidden!